This is one of the most beloved works of Rudyard Kipling, published in 1901. The title character is a street urchin named Kimball O'Hara (called Kim throughout the novel), the orphan son of an Irish officer and his wife. Kim has been befriended by the Pathan horse trader and spy Mahbub Ali. He wanders around the streets of the city of Lahore happily, mingling with all the many races, and occasionally running secret errands for Mahbub. He meets Teshoo Lama (usually called the Lama) who is Walking the Earth seeking enlightenment. Kim follows him and has adventures over a long period leading all the way to the Himalayas, where he foils a Russian and a French agent. It is left with an open ending as Kim must decide whether to continue as the Lama's disciple or become a full time spy. This novel is a formless one in plot, almost Picaresque, and depends primarily on character and setting which is not unknown for Rudyard Kipling (Kipling's greatest talent was arguably in setting rather than plot). It is one of the first spy novels ever told though it was in fact something of a Genre Buster because its focus went beyond espionage. Interestingly it captures the feel of Real Life espionage quite well. The actual nature of given missions is seldom revealed, nor is the identity of the enemy they are facing at a given time (with the exception of a Russian expedition in The Shangri-La at the end) and at first Kim doesn't even know who his own side is; which is of course what things would be like for a real spy. One of the book's strengths is its beautiful cross-section of life in British India. In 1950 Kim was made into a well-received movie starring Dean Stockwell as Kim and Errol Flynn in his last great adventure movie as Mahbub Ali. 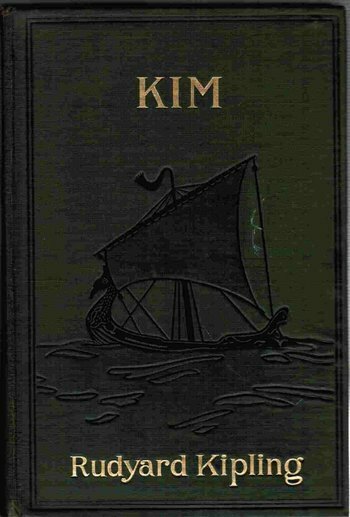 Author Avatar: Kim may have been an expression of Rudyard Kipling s nostalgia for his boyhood. The keeper of the Lahore museum or "wonder house" is a portrait of Kipling's father who really was the curator of a museum there. Boarding School: Kim spends three years at one, but "A boy's time at school is of no interest to anyone but his parents, and Kim was an orphan." Brotherhood of Funny Hats / Ancient Conspiracy: Kim's father was a freemason. Like Reverend Bennett, Colonel Creighton, and the author of the novel. It also is an example of Canon Discontinuity, as the Downer Ending to Lispeth ("in a little time, she married a woodcutter who beat her after the manner of paharis, and her beauty faded soon") is ignored and as the Woman of Shamlegh she is a woman of substance who lords it over her two husbands and would not mind making Kim her third. Strickland, the police officer who "arrests" E23, appeared in several earlier short stories, starting with "Miss Youghal's Sais", which like "Lispeth" was collected in Plain Tales from the Hills. Mahbub Ali (or at least a character with the same name) appears in Ballad of the Kings Jest. The Champion: the Lama's inexperience causes Kim to be this for him. There is a bit of calculation to this as being the disciple of a wandering seeker makes for good cover in India, a fact that Kim is well aware of. However Kim does have affection and a considerable protective instinct for the unworldly Lama. And the calculation is mainly on the part of Kim's superiors. The boy had voluntarily been the Lama's disciple before being officially involved in the spying, and to him, playing the "Great Game" and being a disciple are just different parts of himself. Character Development: The novel is mostly about Kim's coming of age story, but the Lama also changes, becoming much more comfortable with crowded India and modern transport, travelling all over India with trains and steamships while Kim is stuck in school. City of Spies: Lahore just to start with. Who hold Zam-Zammah, that 'fire-breathing dragon', hold the Punjab, for the great green-bronze piece is always first of the conqueror's loot. Covert Group with Mundane Front: The Ethnological Survey doubles as the secret service of British India. Crouching Moron, Hidden Badass: Hurree Chunder Mookerjee, "Hurree Babu". Deadpan Snarker: Kim is so good at this that it is his primary defensive mechanism. He can shoo away bad guys by embarrassing them. The Rissaldar-Major, a veteran of the Mutiny they met along the road said "The police of this land are thieves but at least they allow no competition." Exotic Extended Marriage: The Woman of Shamlegh already lives in a polyandrous marriage  which was then and still is Truth in Television for a number of cultures in the Himalayas  when she indicates to Kim that she would like him to become her husband too. The Federation: The Raj is presented as this. Fish out of Water: the reaction of some British like Reverend Bennett and Father Victor when coming to the unfamiliar environment of India. On the other hand, Colonel Creighton, Strickland and Lurgan Sahib have almost gone native. The Lama, as a Tibetan Buddhist and someone more accustomed to using Chinese than e. g. Punjabi, also is very much this, at least at the beginning of the novel. Things change, especially after he meets up with the Sahiba, a fellow Buddhist, if a lapsed one. In later chapters he is shown navigating through India by train and steamer with much more ease and he also for a time finds a home away from home in a Jain temple. Forever War: The Great Game is this. Gambit Pileup: A continuous Gambit Pileup nicknamed The Great Game. There are multitudinous players friendly and enemy and little is told about any of them. Gender-Blender Name: Kim (although not at the time of the writing - it only became a popular girls' name in the 1920s). Genre-Busting: Is this book a spy story or is it a gigantic Slice of Life? Or is it a Coming of Age story? Actually it's all of these. Getting Crap Past the Radar: Isn't Kim a child street vagrant raised by a father who is a drug addicted Shell-Shocked Veteran? If he lived today he would be taken in by child services (as he would have in the novel, if he had not been so good at avoiding the 19th century Indian version). Also Kim does associate with prostitutes etc., at one point getting one of them to help him dye his skin by pretending to plan to seduce a very young girl, and at another point it is hinted that his fellow pupils at the school think that Creighton has a more than fatherly interest in him. Going Native: Kim can effortlessly go native as both a Hindu and a Muslim in India. However, he's warned at school that while Britains in India expected to blend in with the locals, "going fully native" was out of the question, and Kim steps back. Honey Trap: A prostitute secretly working for some unnamed Rebel Leader tries to do this to Mahbub Ali. He is too smart for them and hides the message he is carrying before she can steal it, and recount gleefully later that he could sense how frustrated she was. Indian Political Service: It is not actually said that Kim worked for this, and it did not officially maintain large spy rings in India at the time. However he was doing the sort of work that it did. To some extent all of Kim's important friendships are intergenerational. Master of Disguise: Kim is pretty good at this. He can dress up in proper clothes and act like a member from any caste and religion. One of the reason the Intelligence is so interested in him. Hurree Babu is also no slouch, once even succeeding in fooling Kim. Meaningful Name: Kim is "the little friend of all the world"
The Espionage profession is called The Great Game, especially when the phrase is said to be inspired by chess and the main opponent is Russia. Mighty Whitey: Subverted in that Kim, who is of Irish parentage, learns a lot from his European schooling, but also from his adopted homeland and the Lama, and he feels more at home being a native rather than a "Sahib" (word used to call Anglos in India). Kim himself puts it rather snarkily while referring to a British priest. Kim: The thin fool who looks like a camel says that I am the son of a Sahib... he thinks that once a Sahib is always a Sahib. However, towards the end, Kim starts to think of himself as a Sahib and this creates tensions between him and the Lama. MultiTribal team: Played straight and quite well. Aside from the major characters which come from diverse castes people from all over India are met randomly along the road, or what not. There are no major villains and most characters come off as more or less likeable. The feeling is that India is a rainbow of castes and the British while the ruling class, are treated by the locals and perhaps even by themselves as just another caste. To a large degree this is Truth in Television, though presented in something of a Lighter and Softer manner. The Prophecy: There are two prophecies in the novel about Kim in the book, one handed down from his father and garbled by the people who raised him, and another uttered by a Hindu priest in a village he and the Lama pass through. Both turn out to be true. Rule-Abiding Rebel: Kim bristles at service and authority figures but gradually he comes to accept his role and function as a spy in the service of the British Empire. The Shangri-La: Subverted. Teshoo Lama as a former abbot of a Tibetan monastery arguably comes from there, but Kipling deals with Lamaism pretty much realistically. Towards the end of the book he and Kim travel into a different part of the Himalayas (further to the West) which does not fit the "mystical place in the mountains" stereotype. There is no Deathtrap or Tome of Eldritch Lore, it is simply another country. And the Lama receives his enlightenment only after he leaves the mountains and returns to the plains. Teen Superspy: Kim is a moderate example. He starts off in a plausible non-super way as a Street Urchin who is used by a passing spy to carry messages for him. The only thing super about him is his ability to flawlessly enter every culture in India. Very Loosely Based on a True Story: In the years before the book was written, a young, light-skinned, blue-eyed Indian man was charged with murder. Around his neck, the police found a leather bag which the man claimed was a charm. When the bag was opened, it proved to contain a birth certificate proving his father was an Irish soldier. The case received a fair bit of publicity, and too many details add up for it not to have been Kipling's source of inspiration. Walking the Earth: Much of the book is about just travelling around like any other traveller. Brownface: In-Universe, Kim sometimes does this to masquerade as an Indian. Crashing Through the Harem: Kim falls through a thatched roof and right into a room of harem girls.